PHNOM PENH, CAMBODIA - MAY 01: Municipal security guards gestures towards a journalist during the Labor Day demonstration near Freedom Park on May 1, 2014 in Phnom Penh. 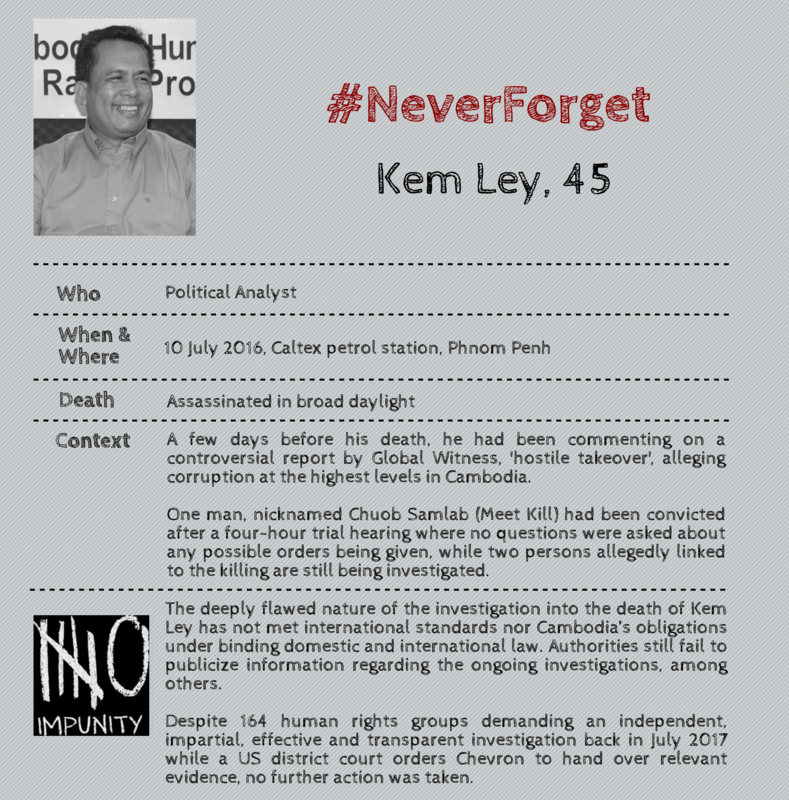 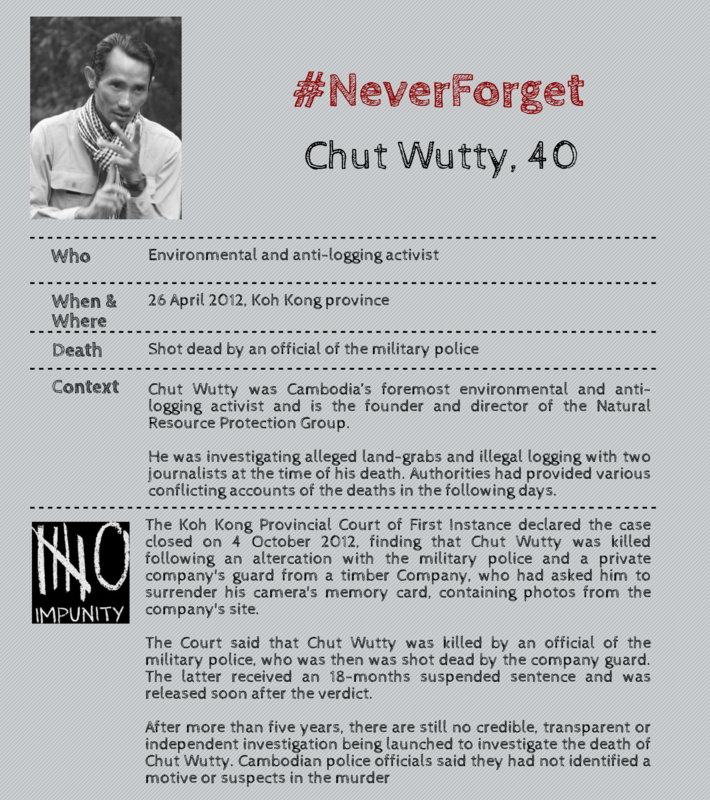 On the occasion of the International Day to End Impunity for Crimes against Journalists, we, the undersigned civil society groups and communities, condemn the ongoing impunity enjoyed by perpetrators of crimes against journalists and human rights defenders in Cambodia, and urge the authorities to take immediate action to ensure the effective, independent, and transparent investigations of all crimes. 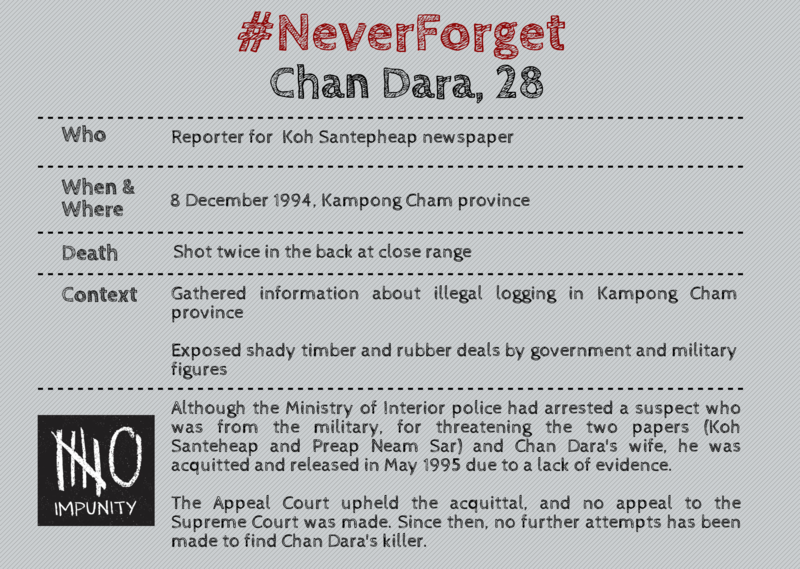 In 11 out of these 13 cases, no one was convicted for the murders; in seven, no suspect was arrested or interrogated. 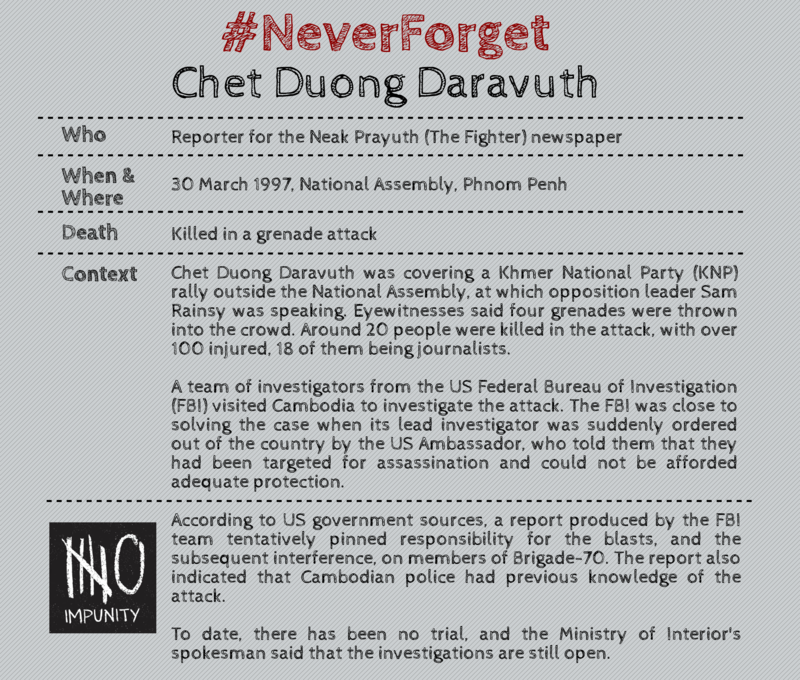 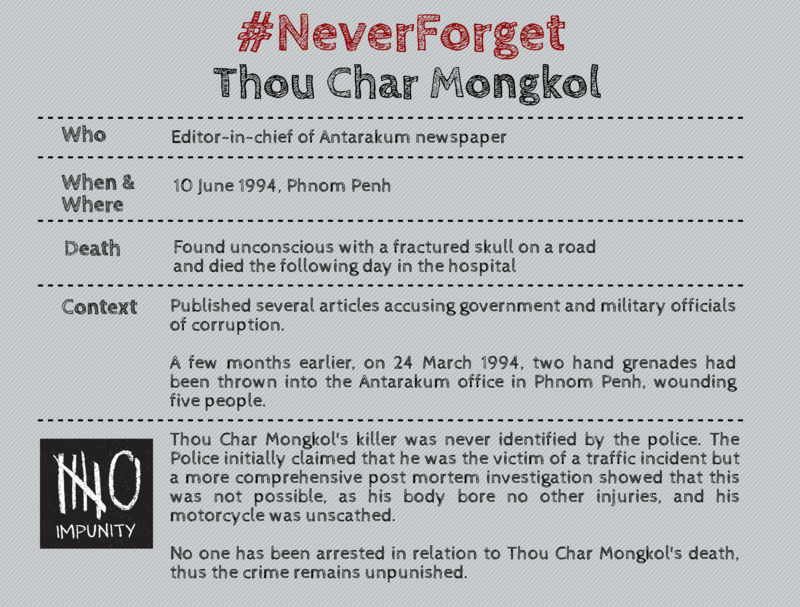 For instance, the killers of Thou Char Mongkol, the editor-in-chief of Antarakum newspaper who was found unconscious with a fractured skull on a road in June 1994 after having published several articles accusing government and military officials of corruption, were never identified by the police. 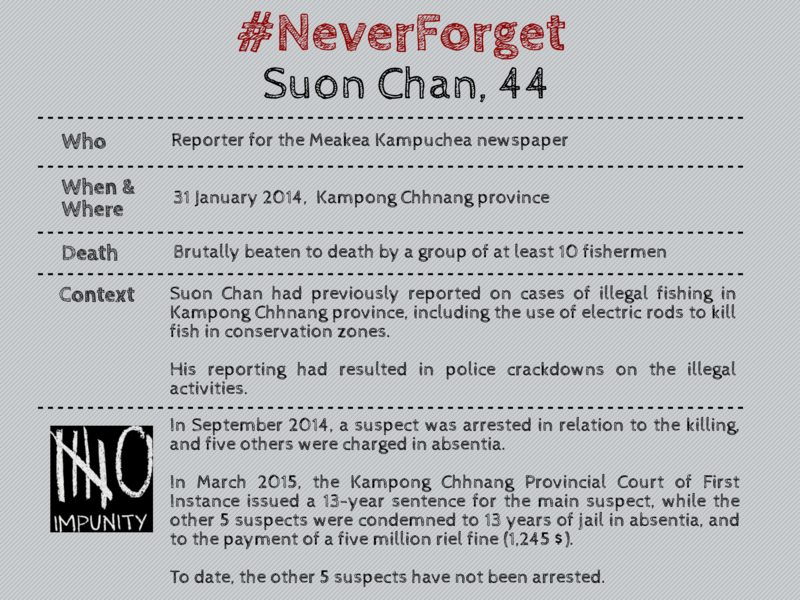 Instead, they claimed he was the victim of a traffic accident. 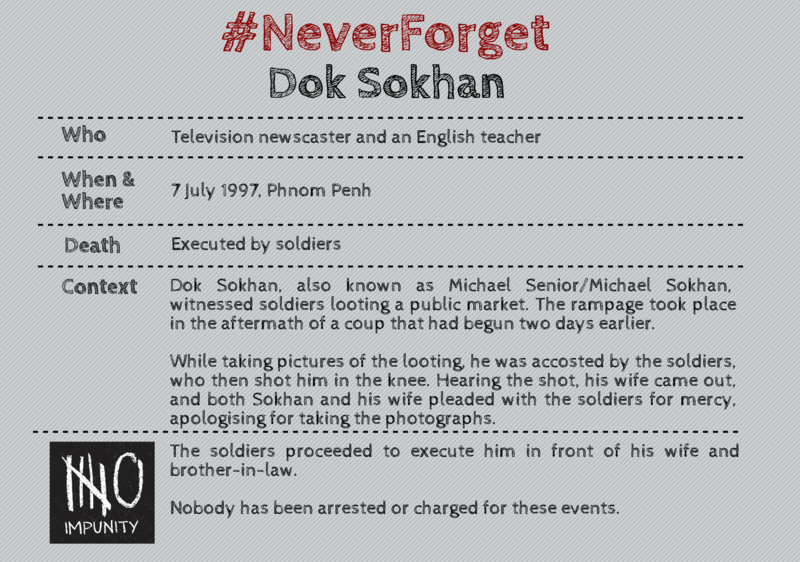 Similarly, even though Dok Sokhan was shot dead by two soldiers in July 1997 after having taken photos of them looting a market, no one has been arrested or charged. 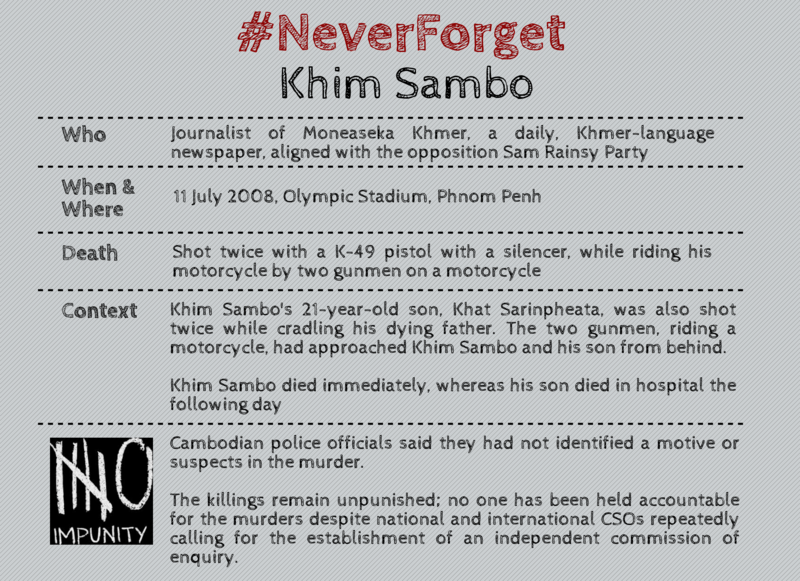 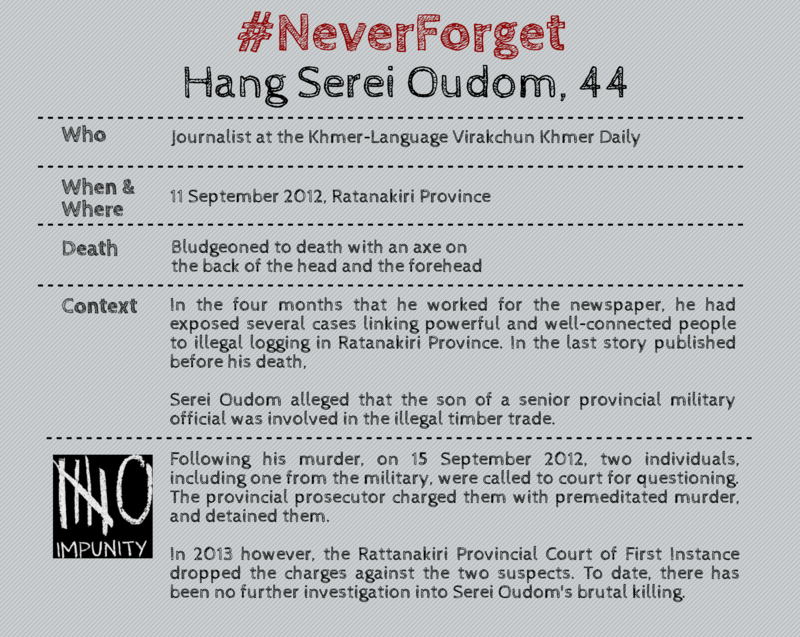 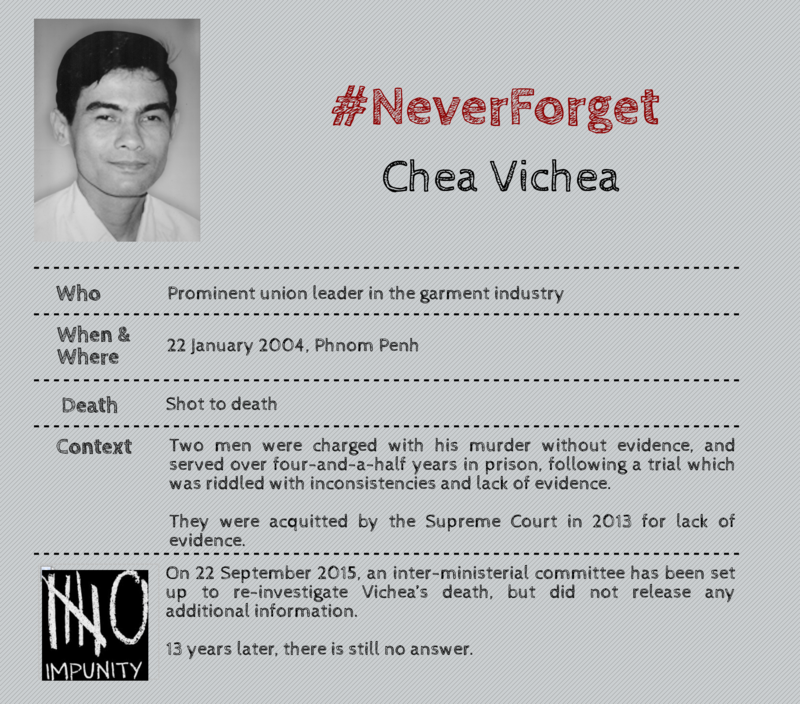 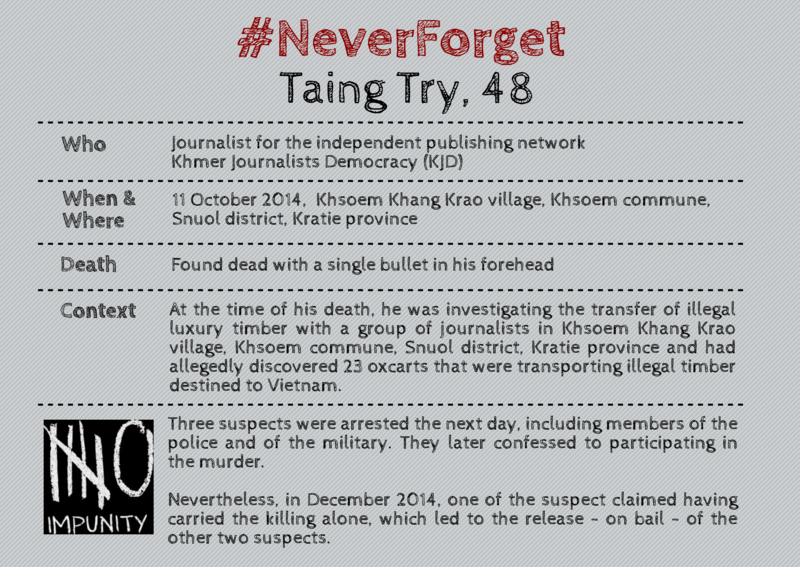 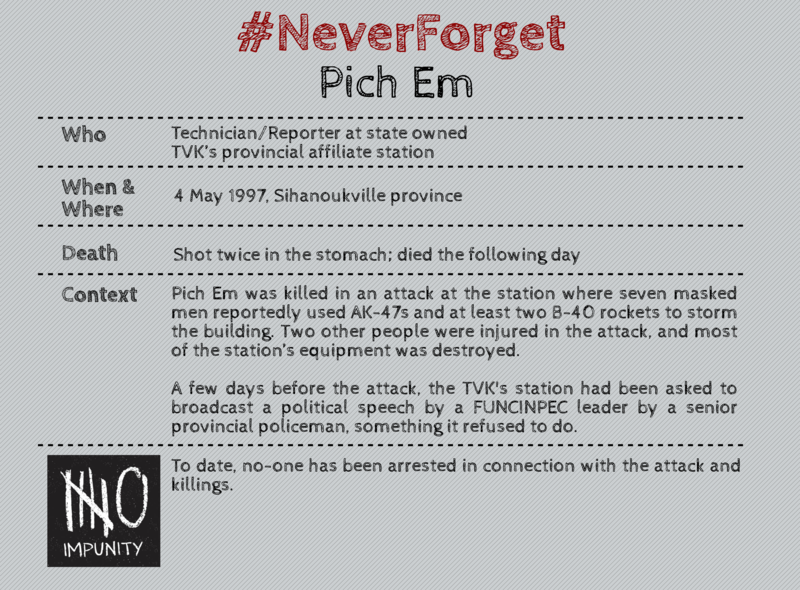 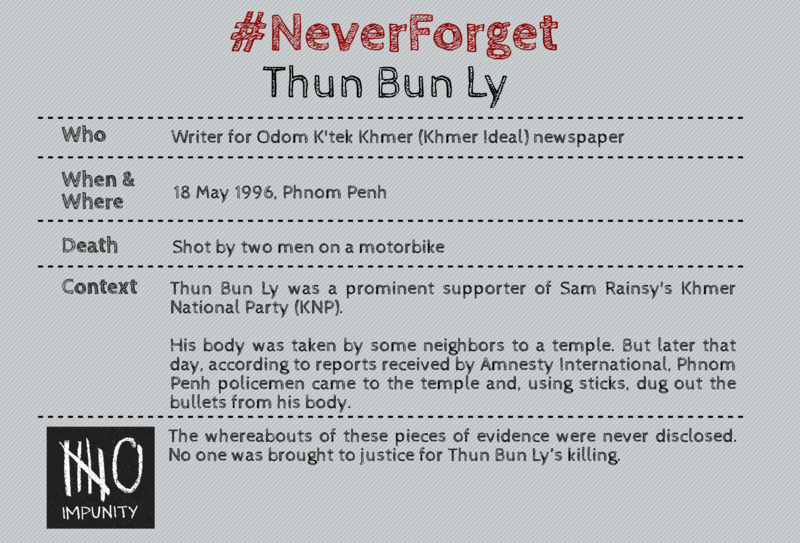 Another illustrative example is that of Khim Sambo, a journalist at Moneaseka Khmer, a daily newspaper aligned with the opposition party, who was shot dead by two men on a motorcycle in July 2008. 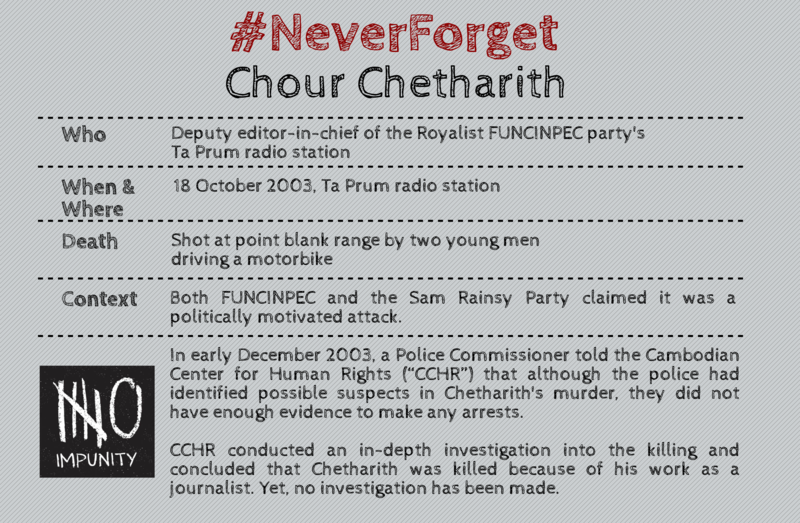 10 years later, calls for an independent commission of enquiry have been ignored and those responsible have not been brought to justice. 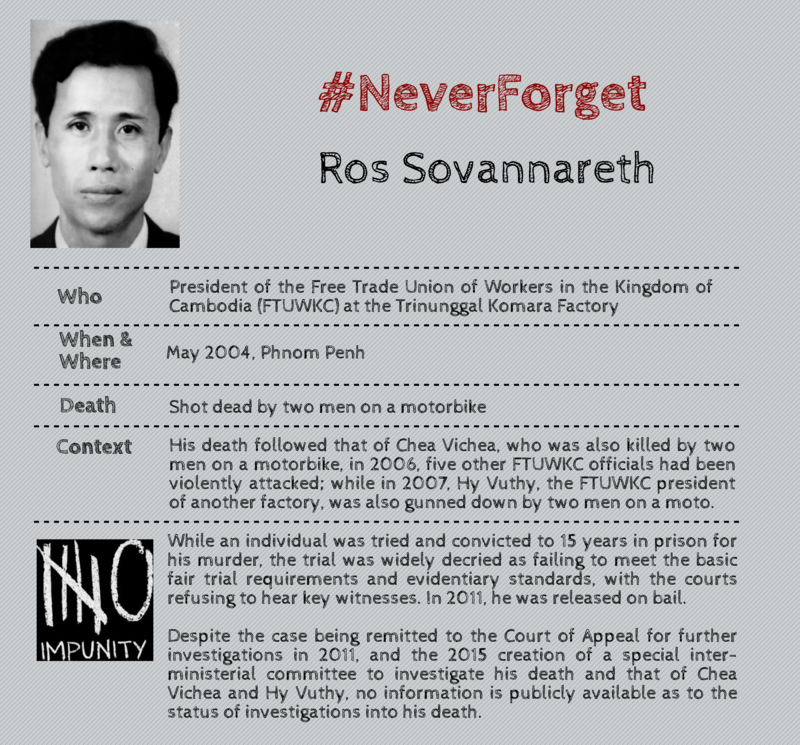 We condemn the rampant impunity that harms Cambodian people and society and demand justice for all those whose rights have been cast aside. 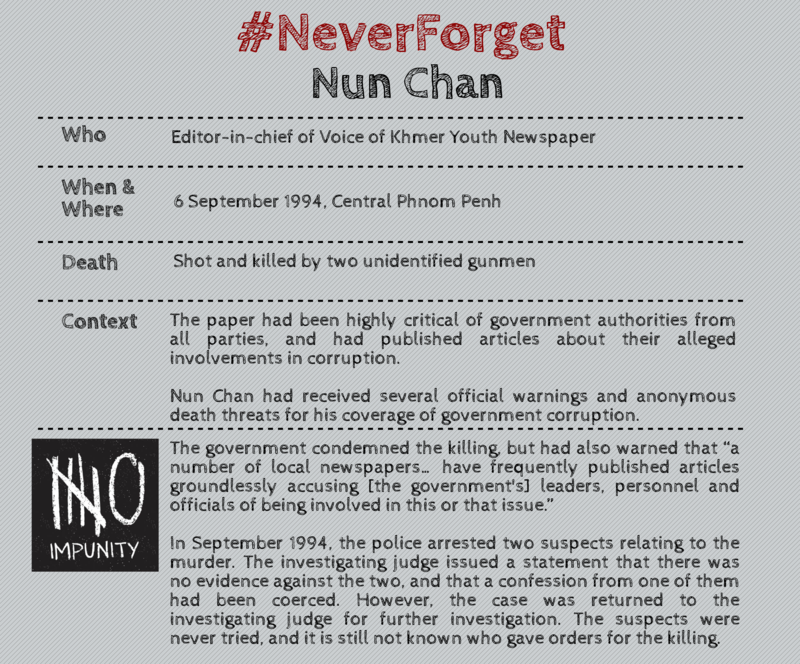 We call upon the authorities to prosecute perpetrators of crimes committed against journalists and human rights defenders by undertaking effective, independent, and transparent investigations and prosecutions in accordance with international human rights standards, including the International Covenant on Civil and Political Rights, the United Nations Plan of Action on the Safety of Journalists and the Issue of Impunity and the United Nations Economic and Social Council's updated set of principles for the protection and promotion of human rights through action to combat impunity, and to restore the integrity of the Cambodian legal system.